I picked this book up while I was on my Southern book tour at the recommendation of a bookseller. Not that I’ve ever needed any prodding to dive into a Stephen King novel, master storyteller that he is. 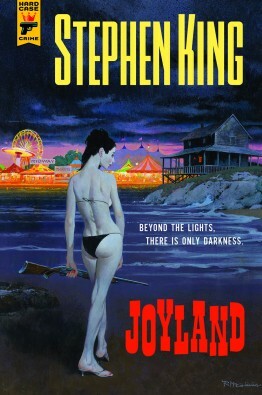 Joyland was less supernatural and more reality than some of his work, much more in the vein of his short story, The Body (which became the movie, Stand By Me). It’s a short fast read, filled with great characters. There was only a touch of the paranormal, with the mystery of a ghost that appears in the funhouse … not so fun after all for the girl murdered inside the ride years before. In the spring of 1973, broken-hearted, cash-strapped Devin Jones takes a job at the Joyland amusement park. What he finds at this seaside getaway is more than a summer job. He forges relationships both fleeting and life altering. In addition to the colorful full-time Joyland workers, Devin finds lasting friendship with a couple of other college summer-workers. Outside of the amusement park, Devin also meets a mother and her dying ten year old son, two people who will make their marks the man he is to become. As always, King paints a picture both vivid and engaging. There’s a fun summer atmosphere for most of this book; coming-of-age events for the lovelorn Devin, lots of carny lingo (both actual and born of the imagination of the author) and a revisiting of a time before Disney-mania strangled the life out of small time amusement operations. Later in the story, the focus shifts to the mystery of the ghostly girl in the funhouse. Both aspects of this book are equally entertaining. I need not tell you this is a well-crafted story; the author’s name on the cover does that. I will say it’s great non-horror Stephen King at his best. Thank you, Mr. King for accompanying me on my long trip through the South.